This article is about the financial term. For the merchandising concept, see Aftermarket (merchandise). The secondary market, also called the aftermarket and follow on public offering is the financial market in which previously issued financial instruments such as stock, bonds, options, and futures are bought and sold. Another frequent usage of "secondary market" is to refer to loans which are sold by a mortgage bank to investors such as Fannie Mae and Freddie Mac. The term "secondary market" is also used to refer to the market for any used goods or assets, or an alternative use for an existing product or asset where the customer base is the second market (for example, corn has been traditionally used primarily for food production and feedstock, but a "second" or "third" market has developed for use in ethanol production). The secondary market for a variety of assets can vary from loans to stocks, from fragmented to centralized, and from illiquid to very liquid. The major stock exchanges are the most visible example of liquid secondary markets - in this case, for stocks of publicly traded companies. Exchanges such as the New York Stock Exchange, London Stock Exchange and Nasdaq provide a centralized, liquid secondary market for the investors who own stocks that trade on those exchanges. Most bonds and structured products trade “over the counter,” or by phoning the bond desk of one’s broker-dealer. Loans sometimes trade online using a Loan Exchange. Courtyard of the Amsterdam Stock Exchange (Beurs van Hendrick de Keyser in Dutch) by Emanuel de Witte, 1653. 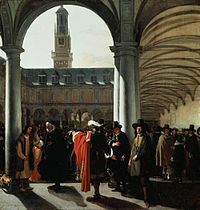 With the founding of the Dutch East India Company (VOC) and the rise of Dutch capital markets in the early 1600s, the 'old' bourse became a formal exchange that specialize in creating and sustaining secondary markets in the securities (such as bonds and shares of stock) issued by corporations. 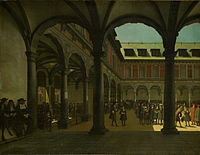 Courtyard of the Amsterdam Stock Exchange (Beurs van Hendrick de Keyser). In the secondary market, securities are sold by and transferred from one investor or speculator to another. It is therefore important that the secondary market be highly liquid (originally, the only way to create this liquidity was for investors and speculators to meet at a fixed place regularly; this is how stock exchanges originated, see History of the Stock Exchange). As a general rule, the greater the number of investors that participate in a given marketplace, and the greater the centralization of that marketplace, the more liquid the market. Accurate share price allocates scarce capital more efficiently when new projects are financed through a new primary market offering, but accuracy may also matter in the secondary market because: 1) price accuracy can reduce the agency costs of management, and make hostile takeover a less risky proposition and thus move capital into the hands of better managers, and 2) accurate share price aids the efficient allocation of debt finance whether debt offerings or institutional borrowing. The term may refer to markets in things of value other than securities. For example, the ability to buy and sell intellectual property such as patents, or rights to musical compositions, is considered a secondary market because it allows the owner to freely resell property entitlements issued by the government. Similarly, secondary markets can be said to exist in some real estate contexts as well (e.g. ownership shares of time-share vacation homes are bought and sold outside of the official exchange set up by the timeshare issuers). These have very similar functions as secondary stock and bond markets in allowing for speculation, providing liquidity, and financing through securitization. It facilitates liquidity and marketability of the long term instrument. It also provides instant valuation of securities caused by changes in the environment. Private equity secondary market refers to the buying and selling of pre-existing investor commitments to private equity funds. Sellers of private equity investments sell not only the investments in the fund but also their remaining unfunded commitments to the funds. Due to the increased compliance and reporting obligations enacted in the Sarbanes-Oxley Act of 2002, private secondary markets began to emerge, such as SecondMarket and SecondaryLink. These markets are generally only available to institutional or accredited investors and allow trading of unregistered and private company securities. Digital currency exchanges are increasingly being regarded as secondary markets. ^ "What is secondary market? definition and meaning". BusinessDictionary.com. Retrieved 10 September 2018. ^ a b Staff, Investopedia (2003-11-25). "Secondary Market". Investopedia. Retrieved 2018-08-06. ^ "Secondary Patent Markets: A Possible Role for Startups". Retrieved 10 September 2018. ^ Conscious, Crowd (June 3, 2017). "ENSListing.com". Medium. Retrieved 2017-09-04. ^ Froelings, Lisa (August 1, 2017). "Cryptocurrency Exchange BitcoinFundi Now Allows to Trade Dash". CoinTelegraph. Retrieved 2017-09-04.